Articles on Macrobiotics by Michael Rossoff - Michael Rossoff, L.Ac. MacroMuse was founded by Michael Rossoff as a local newsletter for the Washington, D.C. macrobiotic community, in the Fall of 1981. This was a time of increasing public awareness about many “alternative” healing approaches. Macrobiotics sprang forth into national prominence with the publication of Anthony Satillaro’s book, “Recalled By Life,” which was later condensed into a feature article in Life magazine. After a year of producing a local newsletter, Michael was inspired to reach a larger audience. So began the seventh issue of MacroMuse, the first of 26 issues with color covers and full-scale magazine format. Beginning with a small readership in 1982, this “homespun” magazine quickly grew to over 5,000 subscribers, with an additional 7,000 copies sold on newsstands around America. During the next six years a small staff evolved; the professional quality and reputation of the magazine also grew. Many fine people contributed articles, art, ideas and criticisms. Among the authors were Tom Monte, John and Jan Belleme, Herman Aihara, Rebecca Theurer Wood, Ron Kotzsch, Lenny Jacobs, Mark N. Mead and many others. All are in .pdf format, as copies from the original publication. Depending on your computer, the file may open immediately or otherwise be downloaded automatically to your hard drive. We begin by posting two articles written about George Ohsawa, the modern originator of macrobiotics. These two articles, by Herman Aihara and Ron Kotzsch. were originally published in 1982. Here are excerpts from numerous George Ohsawa books. These quotations will give you a direct feeling of the man and his vision. The following two articles, by Michael Rossoff, offer very different sides to macrobiotics--the first as an approach for self healing and the second as a reflection on the challenges for counselors. With the passing of Michel Abehsera in June 2014 at 80 years old, here is an important interview with him from 1985. The following four articles are very different from each other and represent the variety of articles that MacroMuse published. “The Myth of Judgment” by Leonard Jacobs, published 1984 as part of the "Forum" on macrobiotics. Lenny was the long-time publisher of East West Journal, the premier magazine of macrobiotics and natural healing during the 1970s and 1980s. Lenny still lives in Massachusetts and works for Shambhala Publications. "The Art of Chewing" by Verne Varona, published in 1983. Verne continues writing, teaching and movie making and currently lives in New York City. In honor of Shizuko Yamamoto's 90th birthday in June, 2014, here is her life story as told to Carolyn Heidenry (now Sharp). “Life Journey of a Masseuse Extraordinaire” by Carolyn Heidenry (Sharp), published 1984. The best articles from the 7 years of publication totaling 75 unique and insightful pieces are now compiled into one large pdf file. Just as the above articles are exact copies of the original publication, so too are all of the rest. 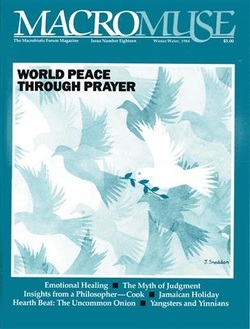 The above 11 articles are included in this compilation. For $20 you will have a treasure trove of timeless articles to inspire and grow your understanding of macrobiotics. YES, I want to buy Best of MacroMuse Magazine for $20.